The Montreal infringement welcomes a variety of collaborations, performances and cultural resistance: theatre troupes, players of all types, street activism, political drama, musicians, radical performances, visual artists, films, marginalized arts, spoken-word, puppet shows, disadvantaged groups, and anyone wishing to artistically infringe on the corporate monoculture that destroys our culture and creeps into every corner of our lives. 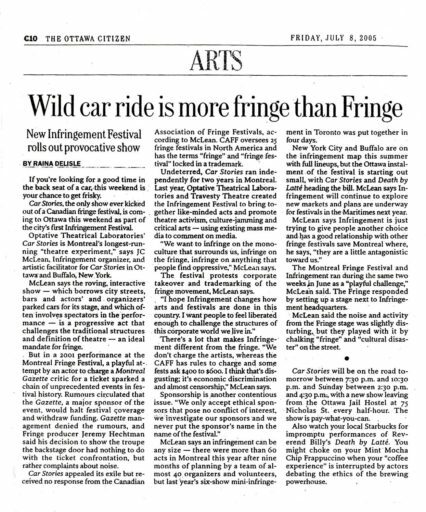 The infringement movement was born on June 19, 2001, when the trademarked St. Ambroise Fringe Festival booted the innovative show Car Stories from the festival, allegedly on orders of a corporate sponsor. When artists didn’t receive their ticket sales after paying hefty fees to participate in the now-trademarked “Fringe” Festival, they were outraged. This sparked off the creation of the infringement movement, an activist and do-it-yourself way of producing the arts based on the original Edinburgh Fringe of 1947. The infringement festival was founded in Montreal in 2004. The infringement festival is mandated to protect grassroots culture by challenging corporate interference and has since been staged in other cities, such as New York, Hamilton, Ottawa, Toronto, Regina, Brooklyn and Buffalo. Incredibly, the festival took root in Buffalo and it currently the largest festival in the city! The Infringement Festival has also participated at the first two World Fringe Congresses in Edinburgh, Scotland. In an effort to persuade Fringe administrators to start putting artists first, in the tradition of the original Fringe of 1947, Infringement has presented workshops and performances at the Edinburgh Fringe and the World Fringe Congress that are critical of excessive corporate manipulation at Fringe Festivals (e.g. “A World Fringe Philosophy?”). While artists from Montreal and Buffalo Infringement festivals had hoped to continue to dialogue with Fringe managers about important issues in the arts, their applications were rejected by the Canadian Association of Fringe Festivals (CAFF), hosts of the 2016 Congress being held in Montreal. CAFF has the word “Fringe” locked in a Canada-wide trademark and uses this fact to exclude people from participating in Fringe arts. Hopefully the Fringe administrators come with an open mind. By taking advantage of this exceptional opportunity, they can learn how to better protect artists and find ways to prevent corporations from compromising what was once an authentic, grassroots, artist-driven festival.